I'm an enthusiastic wallpaper lover. Both Miranda and Natalie's bedrooms have wallpaper plus our kitchen and I really wanted something for our bedroom. I toyed with florals but our bedroom (whole house) is tiny so I wanted to have somewhat of an optical effect to make it feel slightly bigger, or at least not smaller. I also feared florals in our bedroom would be too feminine for the husband. 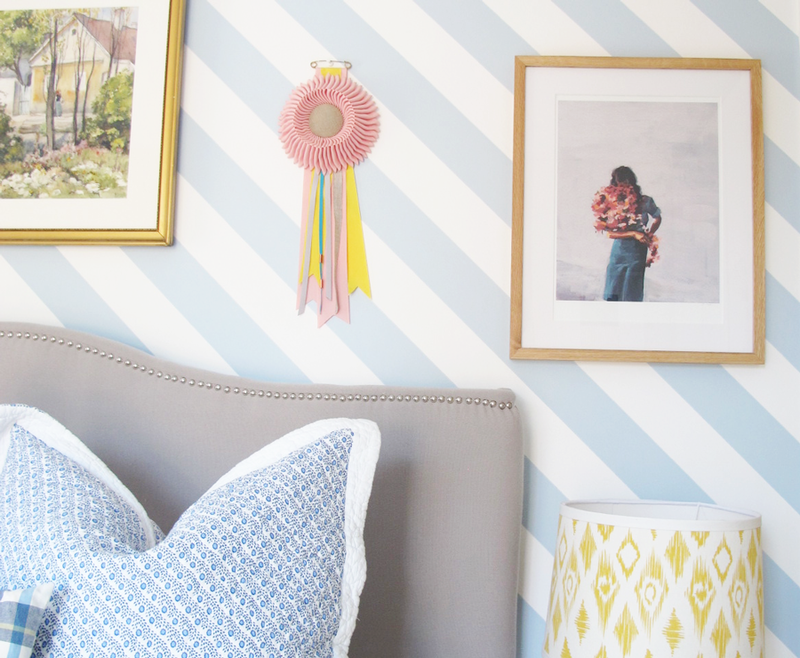 I never felt good about horizontal stripes on the wall, unless they are really tall. 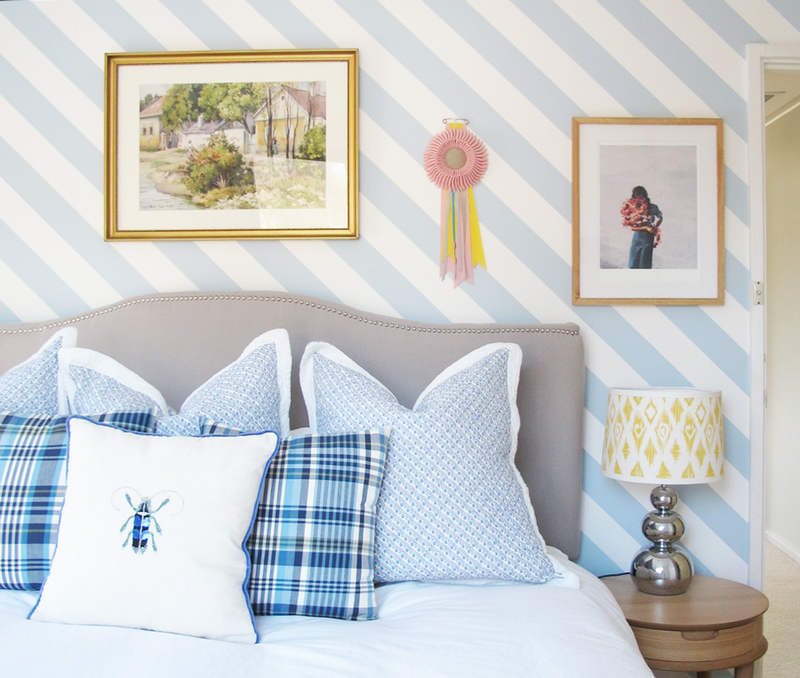 Vertical stripes look good, so long as the room is not too small. 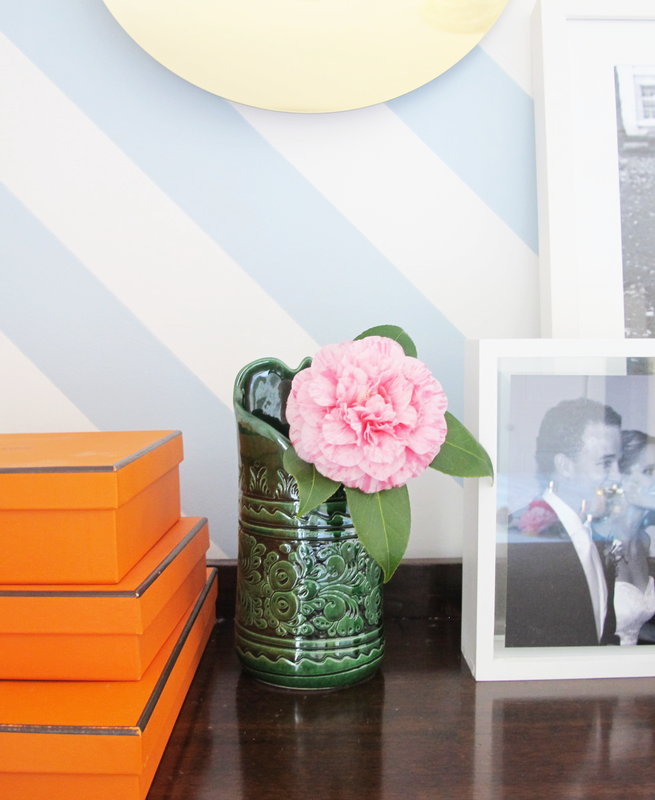 I decided to go with the diagonal stripes trend for a cool take on a classic stripe. Husband was happy too, it kind looked like a business shirt or tie. 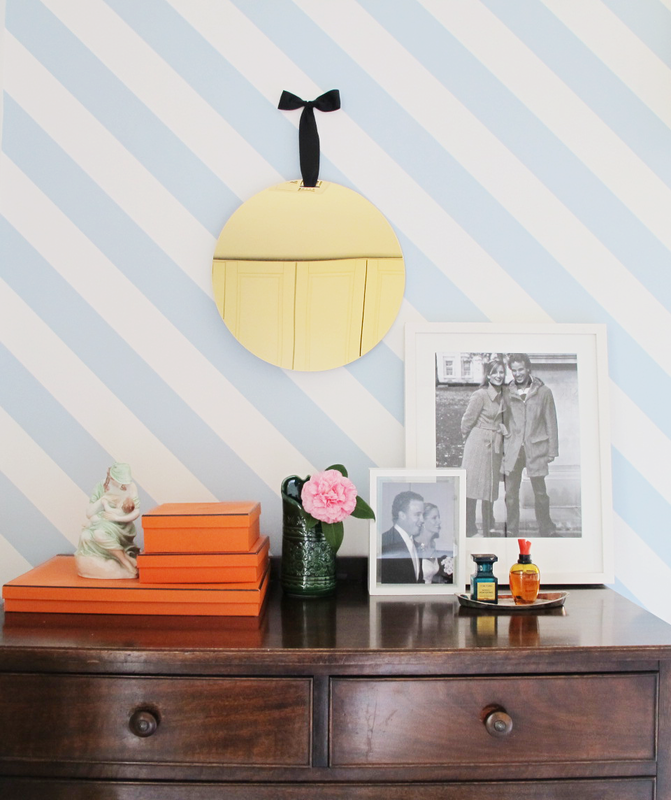 There are some great diagonal stripe wallpapers out there, in particular a range by Greg Natale for Porter's. I wanted a light blue and white diagonal stripe and searched without success. Then I came across this pin from York Wall showing their stripe wallpaper pasted vertically, horizontally and diagonally. It was the perfect colourway so I ordered 4 double rolls from The Fabric Company for $360 including shipping. Then I set about hanging the wallpaper diagonally in our room. I've wallpapered a couple of rooms this year so I felt ready for the challenge of hanging it on a angle. I learned how to wallpaper by watching YouTube clips and with the encouragement of my mum who wallpapered many a room when we were kids. There are different techniques used and they are all useful. But I will share with you what I learned and my tips. 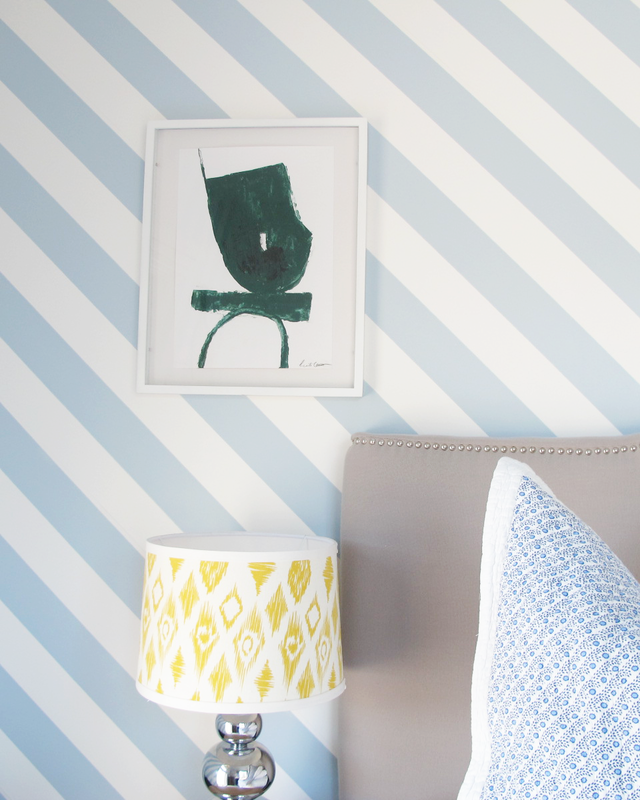 The nice thing about stripe wallpaper is that pattern matching is easy. It is much easier than trying to line up drops of any other pattern. There is no horizontal pattern matching needed because there is no vertical pattern repeat. The plum line that you draw on the wall to get the first and subsequent drops at the right angle has to be at a 45 degree angle. I measured it in from the left-hand bottom corner using a spirit level. The wallpaper was great quality. The better the quality wallpaper, the easier it is to put it up. I love wallpapering, it's like gift wrapping a room. I find it a hell of a lot easier than painting. I never doubted my decision. I loved it when I started and I love it now. It keeps the room and all the things in it from feeling too stuffy. Gravity was not my friend. The only thing harder than hanging it diagonally would have been to hang it horizontally. The wallpaper was pre-pasted which means it already had water activated glue on it. I cut each drop to the right length then lay it flat on towels and sprayed it liberally with a water bottle. I think ideally you would need two people to do it - one person to position it at the top and one person to position it at the bottom so it doesn't roll off a rip across the drops. Once I figured out the hard bits of a project I tend to tire of it so there was a gap of time when our bedroom was half wallpapered. This drove Capricorn husband quietly crazy. 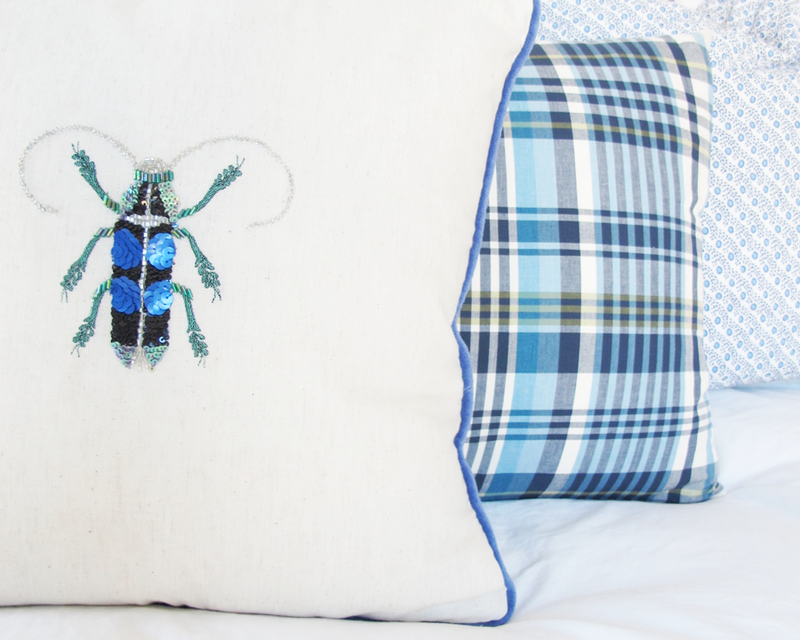 - Bug cushion from Pillow Talk. There has been the odd occasion when I have come into the bedroom in dim light and out the corner of my eye seen the bug shape and felt briefly startled. Our house has not been without its own unique biodiversity over the years (grin face). 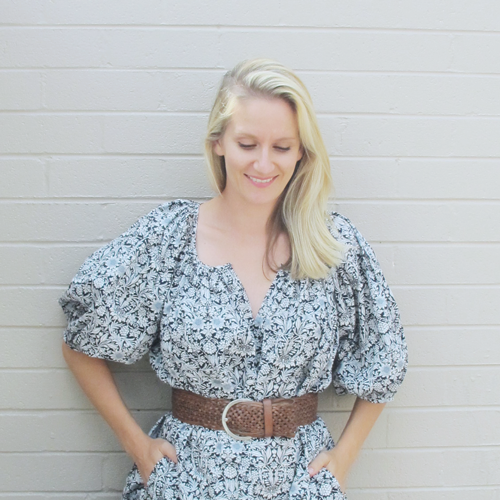 - Pink rosette from Skinny Wolf. - Green painting by Heather Chontos. - Herend porcelain figure of a mother nursing her baby that was a gift from my mum.